I received a beautiful drawing today. After, "Tell me about it," only lent that it was a drawing for me, I mistakenly, I asked, "Are these characters you made-up or people you know?". I think everyone within earshot gave me a look of "How ignorant and uncool is Mrs. Elder!". Another person, not even the fabulous artist, told me they were characters from a book series (and if you didn't know, it's George and Harold from Captain Underpants). This is my apology, students. I'll try to be more up-to-speed on my pop culture. While introducing warm and cool colors to the second graders today, I noticed my class had on very colorful shirts. I started calling out names and had students come to the front of the class. What did they notice? These seleceted students all were wearing warm colored shirts! I thought I was on a roll, but.... almost. We were missing a green to complete the cool colors. Here was today's color schemes. I'll see if I can get a complete ROY G BIV soon! Thanks second grade helpers! I'm having a fun time hearing the squeals made by Kindergarteners and First graders as they each take a turn at mixing colors. 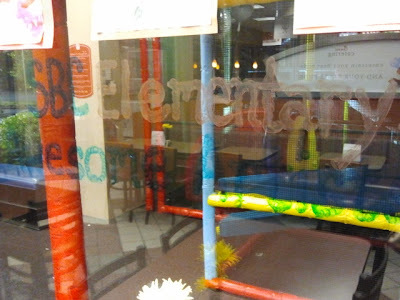 From a teacher's perspective, it's fun to see which students gravitate toward certain colors. 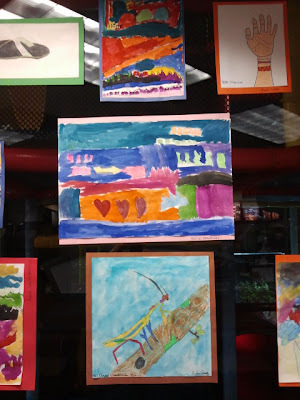 During first grade all week I've had some students really enjoy making dark, dark colors while other stick to the main color combinations (mixing the primary colors to create three new secondary colors). The first graders also are having the experience of mixing white into their color palate to create tints of the specific color. Some students end up using white on all colors and it looks like a paper of spilt sherbet. Other students blatantly reject the white! Although I gave them brown at the end of the day to make a tree on a separate piece of paper, one student was so excited about her new-found knowledge. She mixed all the colors together. What do you know? She created her own brown. Very proudly (and politely) she told me she didn't want my brown because she could make her own! Oh my! I hope the gawks of amazement continue. These are the precious teaching moments I wish I could bottle up. We've been so busy I'm out of breath! It's true, this week all grades will have completed their first art lessons. Some grades have worked on more in this time - those speedy Kindergarteners are on their third lesson! Not only does the artwork look spectacular, but a lot of learning has taken place in this colorful room. I have been blessed to witness it. 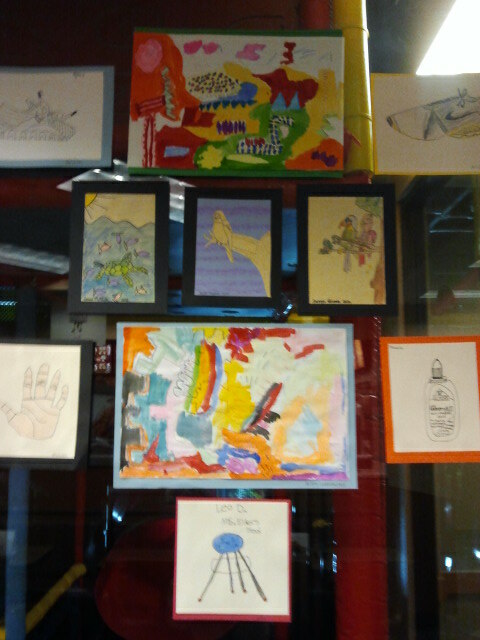 Parents, stop by anytime you want to also witness some fantastic and creative kids at work. We love visitor, and I bet any student would be so happy to tell you what they are working on! How did we differentiate today? Differentiation is a hot word in education. However, it's something that comes very naturally to an art teacher by nature of our job. We have to teach a whole bunch of students the same standards but if one student is not understanding, it is our job to figure out a different way to teach that student (or small group) so he or she can learn the standard. (That is NOT a dictionary definition!) For me, that can include using different sized paint brushes, swapping out markers for paint is the main standard is color (where the material is not an issue but could be a deterrent), using book, flip chart, dances, or other whole body exercises to grasp concepts. We all do not learn the same and even though it is not easy, we should not teach the same to every child. Plus, I find it more fun as a teacher! Today, some students made lines with yarn. They had drawn them and we made them with our bodies but this added another kinesthetic way to manipulate the string to form their desired outcome. I also gave the students a choice as to what materials they wanted to use (out of three) in another class. Using my example, they could see the results and then choose what they wanted based on their wished (many wanted to use oil pastels) and practical artistic brains (but some thought their drawings were too small to create a nice picture with the oil pastels. These budding artists were making choices! Awesome! We are learning and growing! My ears must have grown since I became a teacher. I know my mother would say they are quite different now from my teenage years :) . There are some special moments in the art room where the students are merrily working and talking comfortably among themselves. Maybe some students just don't think I can hear them if they are talking to friends (I'm sure that's part of a developmental level...I'll have to research that more). But I find it so interesting what I overhear. Some is very enlightening, some conversations are downright funny and I have to break in just to converse with these witty students, and others (not too many) are frightening, either in the topics or the students’ lack of what I would deem as common sense - which, in turn, brings it all back to funny. "I just love this painting". "I know, I am such a good artist." "Me too, I never knew how good I was at painting." "I think I'm going to give it to my mom." "I want to, but I really want to keep it for myself. Yeah, I going to keep it; I want to hang it in my room." "So, did 9/11 happen like during the Civil War times." "I don't think so, I think my Dad was born and I don't think he's that old." "No, it didn't happen in Civil War times, that was like 50 years ago, this is the 11 year anniversary, remember, our teacher told us." "When I paint, I feel like the brush is ice skating"
Our compositions have been created and now is the time to...paint! Drumroll please….. 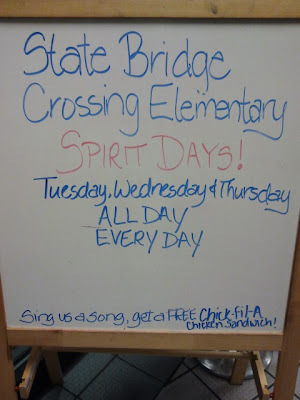 I am proud to announce the Artists of the Month for September at State Bridge Crossing Elementary School. 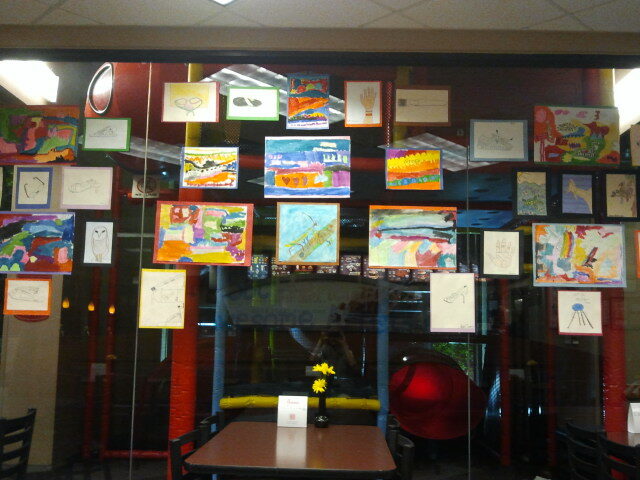 These artists have wow-ed me with their artwork, behavior and attitude. If you get a chance to visit the board, please take time to read what each artist wrote about art. Their statements are very sincere and heartfelt. Way to go! Action Jackson was his nickname (and the book we read to introduce Jackson Pollock). Did you know Pollock used everything from sticks to brushes and even his hands to paint on his large canvases that were on the floor? Not even on a table! This was crazy! 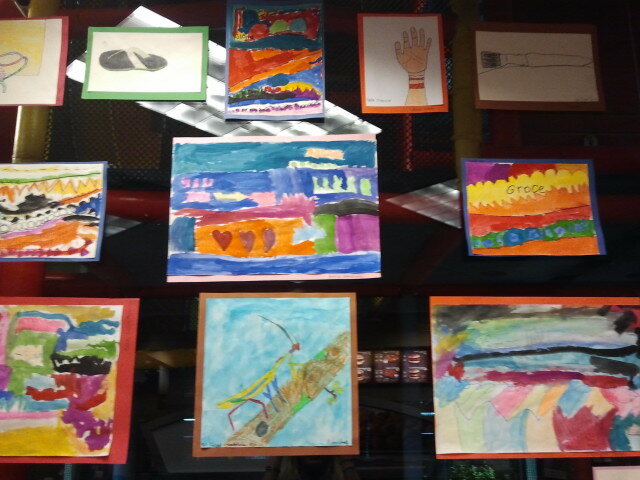 The Kindergarteners learned about the most basic and important part of art (according to Mrs. Elder!) – line! We made lines with our bodies and we spied lines in the classroom. Next, we looked at all the different lines in Jackson Pollock’s artwork and talked about his artwork. Some of the students thought it was beautiful. Some thought it was trash! Some thought it looked too messy and others loved the colors and the excitement of it. These smart Kindergarten Bobcats were very articulate. I can tell we will have a great year of learning in the art class! Check out some of the lines they made as the start to their very first project. VVVVVVVassily Kandinsky. We know the famous Russian artist is spelled with a “W” but you pronounce his first name with a “V”. Oh, how much fun the first graders and I had learning how to say his name! We looked at many of his paintings and each class found an array of different objects and narratives. Our goal was to find all the different kinds of lines he used and to describe how they made us feel. The classes tried and did a good job, but really, it was way too much fun to talk about his overall artwork! What is abstract art? 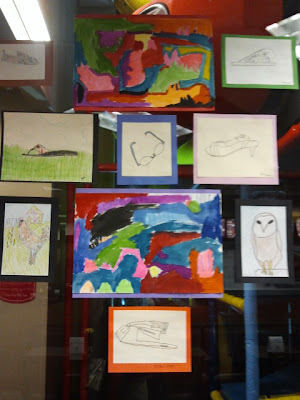 The second graders looked at the abstract art of Calder, Miro, and Leger and dissected the works in terms of shapes and lines. We discussed how many of us think the word organic is used to describe a type of food, but in art class, it is a type of shape that is not geometric. It was fun to point out the organic and geometric shapes in the art works of the famous artists. Next, it was our turn to create our abstract compositions using organic and geometric shapes as well as a variety of lines. Just wait…this is only the beginning! Our first project in third grade is about cityscapes. We had very lively discussions about the shapes and lines seen the different cityscapes. 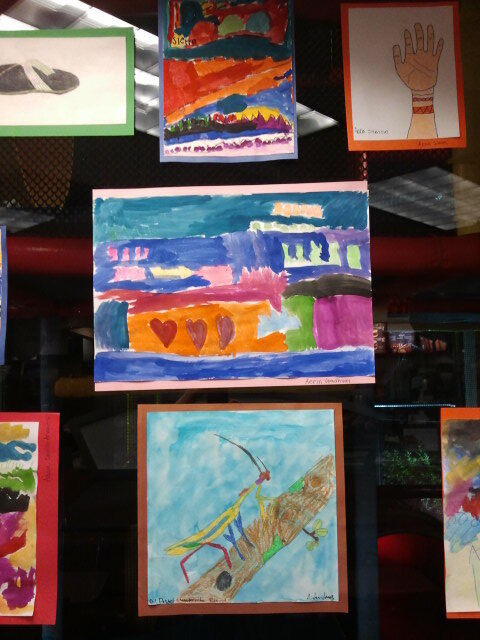 We viewed Paul Klee’s artwork and talked about his use of shape, line and color, particularly in his abstract cityscapes. Why did he choose to use warm color? Why cool? Those are questions our Bobcat artists are going to have to come to terms with for themselves later on in this project. I’m sure the results will be Klee-worthy! Our amazing fifth graders are really impressing me at the start of this year. I can tell they have had some wonderful art education and they each are demonstrating diligence and eagerness to do a great job in art this year. What a true pleasure and joy. This year will be an amazing one for us – I can tell they will learn a lot and we will have a wonderfully fun time in the process. For our first project, we are learning about the difference between gesture lines (the types of drawings the fourth graders are doing) and contour lines. I love it how students make connections. One fifth grader mentioned how the word contour is used when talking about make up. Ding-ding-ding! Correct! So many words we use in art are also used in our everyday life. Some have the same meaning (horizontal line: a line going from left to right or side to side), some have similar meanings (contour: the outline and important ridges of a surface), and some have completely different meanings (value: the lightness or darkness of an object vs. how much something cost). We also talked about how our shoes can shoe our personality. The students looked at different shoes I had brought in and suggested adjectives of the person who might wear such shoes. 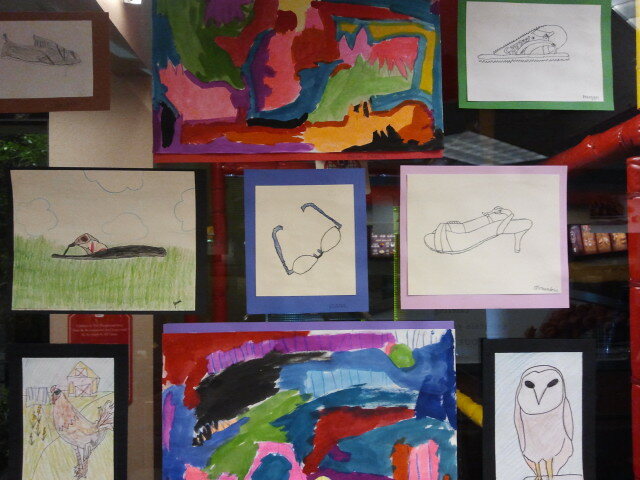 Next, they used their observational drawing skills to draw their own shoes. It was interesting to note how some students set up the composition of their shoes. I am really looking forward to the outcome and the rest of the process with these delightful students.